Lise: You have exhibited quite a lot around Chicago over the past year. Your work was in group shows at Regards and Goldfinch galleries. 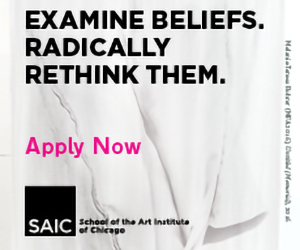 It also was in the Resonant Objects shows at the Arts Incubator and Logan Center Gallery at the University of Chicago in conjunction with your residency with the university’s Artists-in-Residence Program with Arts + Public Life and the Center for the Study of Race, Politics, and Culture. Let’s start by talking about what you were working on during that ten-month residency on the south side. 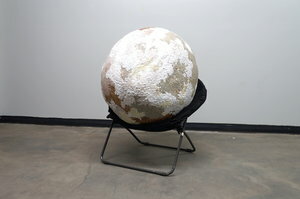 Nazafarin: During the residency at the Arts Incubator, I stopped making objects. My plan was to work with my large-scale so-called “social sculptures,” meaning they could be touched or played with, at Washington Park in order to activate the park’s empty landscape. I did a number of performances with these large, awkwardly shaped objects. 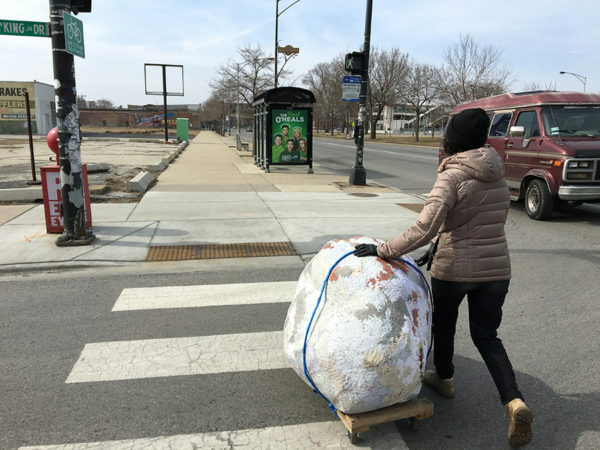 In one, I asked passersby to help me carry it across the street, and then across the park to move between the Washington Park area and Hyde Park neighborhood. I used this activity to initiate conversations with strangers and I made a few videos which were included in the show at the end of the residency. The residency was a good break from what I was doing in my studio. When I was working in the landscape of the urban park, the in-between of the urban environment and nature became very evident—the park as an in-between zone. My interest in creating an experience of interiority in the public space of the park became clear. Lise: Can you explain more about using the experience of “interiority” while being in the park’s “in-between zone” in terms of what you’re exploring in your work? Nazafarin: By interiority, I mean creating intimacy and especially in relation to public space. Interiority and public space don’t go together in an obvious way. I was thinking about engaging in a performance, an activity, to recreate the experience of “art making” in the studio and to allow people to participate in this private zone. During the performances at the park, people came up and talked to me about what I was doing. Sometimes the conversations lasted as long as 40 minutes. We weren’t just talking about what I was doing, at the end we talked about everything else. Nazafarin: Last fall during the performances I felt like people were more open to talk with strangers. We were all in a state of crisis. It was the Trump campaign and climate change that always came up. It was interesting to see how the art became an excuse. Lise: Are you saying that your performance in the park was an excuse for connecting? And the connection allowed for what was most pressing to come out? Nazafarin: People felt comfortable to talk to me because I was doing something unexpected. 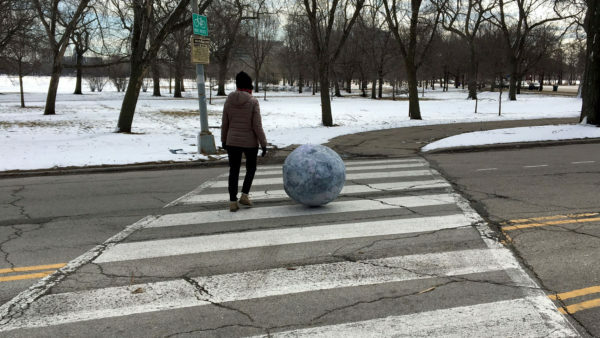 I was carrying or rolling a large ball in the streets and at the park. They approached me out of curiosity about the object. They wanted to know how heavy it was. They weren’t curious about why I was doing this. This led to funny encounters and good stories. It was exhausting too. I wasn’t intruding on the space or a threat to others. I was safe. Because the object was large it was thought to be heavy. Sometimes I was called a super woman for carrying it. Lise: Who stopped to talk to you? Nazafarin: More men than women tend to be on the streets, more young men were crossing through Washington Park. Everyone I asked to help me was willing to do so. Some had their headphones on and didn’t talk, but others wanted to talk. Some men took the object and didn’t want to carry it together. Lise: What about flirting? Was there much of that from the men? Nazafarin: During the performances, I didn’t feel objectified as a woman. Surprisingly no harassment or flirtation of any sort during the performances. I was more comfortable when I was with the objects than without them. One time when I was alone on my bike, not during a performance, a group of young men with water guns sprayed water on me. Lise: How did you move the experience from performing in the park into the gallery? Nazafarin: I had a two-part show. 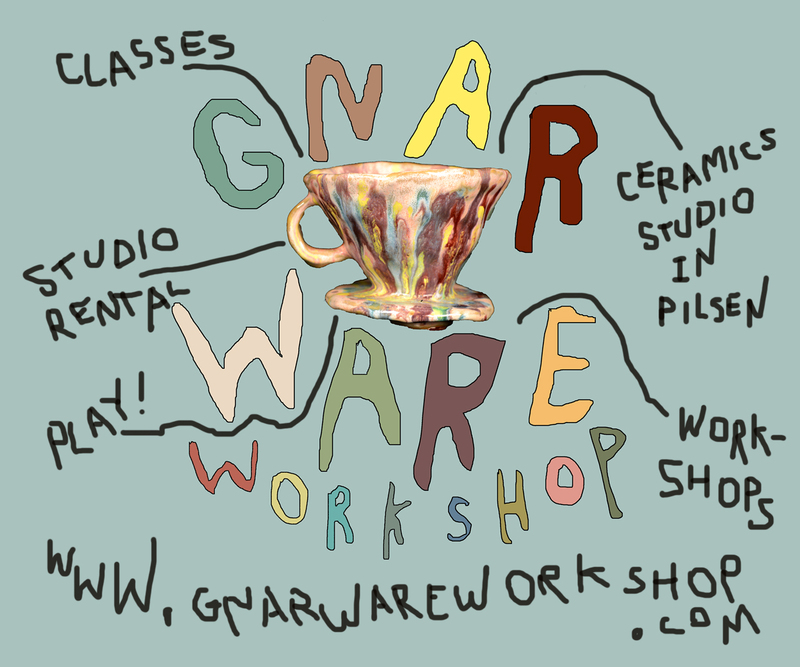 One part was at the Arts Incubator and the other part was at the Logan Center. In the Logan show, I explored the body in relationship to objects through a number of sculptures, and they were accompanied by a printed photograph of a performance at the park. I wanted that image to interfere with how the objects were being read. I also collected everyday objects during my walks in the park and then used them to make vessels in the series, Vessels with Unknown Functions. The Incubator show had two sets of videos from my performances. One video ran in a continuous loop, with me carrying the sculptures in the park through the four seasons. My performance was filmed every Sunday throughout the residency. The other video shows three performances: crossing the street carrying the object with a stranger helping me; taking the object on the CTA green line from the Incubator on the South Side to the Art Institute in downtown Chicago; and taking the object from the Incubator across the expanse of Washington Park to Hyde Park. Crossing through Washington Park to Hyde Park is a theme in these works. I was interested in the transition between these two seemingly different neighborhoods. In this case the park is the border between them. There are many empty lots, almost no grocery stores or restaurants on the west side of the park, while the other side, which is the University of Chicago’s territory, is equipped with all these resources. The disparity is evident in the videos as you watch the bodies move between neighborhoods. And the park is the zone that blocks access from one side to the other. This is the space I chose to work in. Lise: How does the work you’re doing now in your studio relate to what you were exploring in the park during your residency? 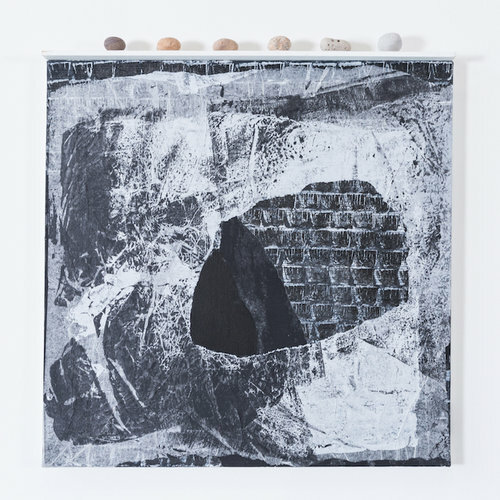 Nazafarin: I was surprised to return to painting after the residency. I needed the focus that painting provides. Lise: It sounds like you needed to retreat to private space after working in public and being in the park. Nazafarin: I needed a clear mental space to think about the next steps. Lise: Why did you turn to painting when you got back to your studio? 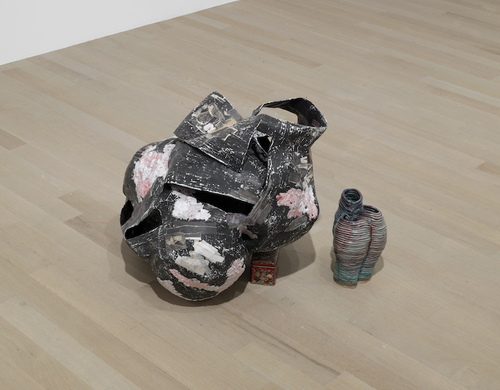 Nazafarin: Being in the park with the objects started me thinking about landscape painting. I began with creating some sort of spatial arrangements on canvases focusing on shifts in point of view from aerial to axonometric. 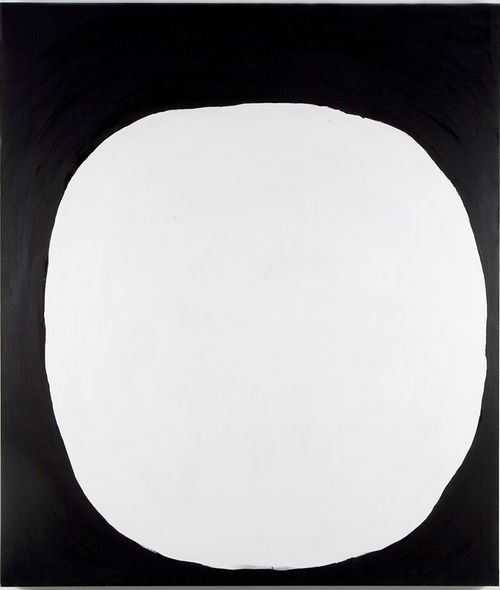 Lise: In one of your artist’s statements, you say, “My practice is grounded on a desire to explore interiority and negative space and their implicit political tensions at the intersection with identity, landscape, and gender.” Is painting a way to explore your interest in interiority and negative space? Nazafarin: In paintings, I move back and forth between flatness and the illusion of depth thinking through issues of representation of space on the surface. But I should say I didn’t make many paintings on canvases after all. I started making sculptural wall pieces and that’s where the interior space of the objects became a priority. At the same time, I was looking at the Russian Constructivists of the early twentieth century, thinking about utopian spaces. I’ve taught drawing classes for six years, and teaching perspective and observational drawing made me very interested in studying Persian miniatures. 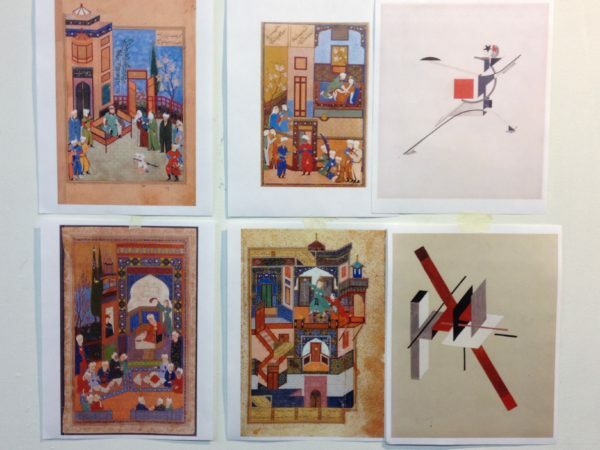 I am particularly interested in Behzad’s miniatures from the Timurid era. The Russian Constructivists and these miniatures are five centuries apart and aesthetically and ideologically they appear very different but they both propose a notion of infinity outside of “realistic” representation. Lise: Looking at these examples you have hanging here side by side in your studio, I can see the resonance between the Persian and Russian works. How do you talk about the two with your students in Drawing I? Nazafarin: They are good counter-examples for everything I teach about creating depth using value, shading, and one point perspective. I am interested in these works because of their disregard for realistic representation of space. Lise: How do they do that? Nazafarin: By removing the human point of view, linear perspective. For example, in El Lissitzky’s Proun paintings, geometric shapes float forward and backward to the infinite. There’s no vanishing point to ground them to a particular location. In Persian miniatures the space is flat and there is no boundary between the interior and exterior spaces. There’s no linear timeframe. Everything happens at once and nothing is concealed. The two have similar diagonal compositions and both move beyond the human perspective. 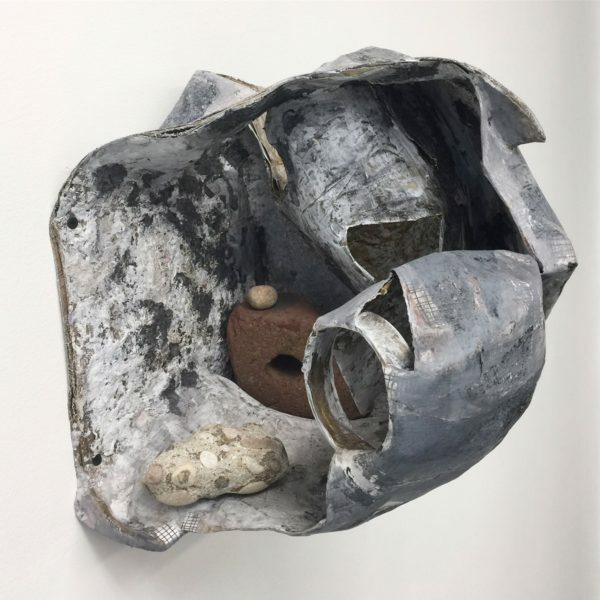 In my recent wall sculptures, my response to these works has been to subvert the universal and supreme point of view of the Russian Formalists and the Persian Miniaturists and rather introduce the human viewpoint and experience. Instead of flattening, I stretch two-dimensionality into physical space, creating three-dimensional painterly objects with multiple points of entry. 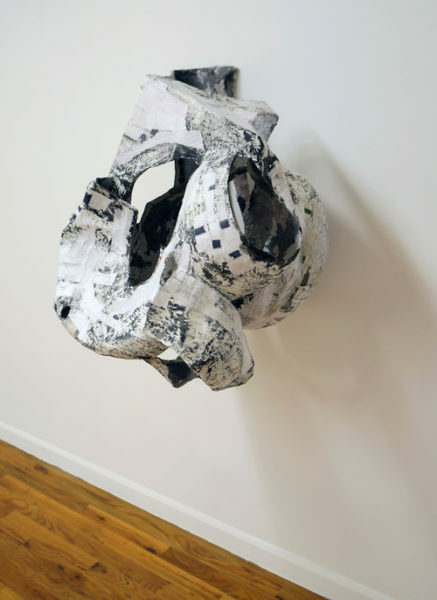 I’ve been concerned with the interior spaces of these sculptural paintings and how they are actually viewed. The viewer can bend or tiptoe to peer in through the holes to experience the work at her own pace and scale. In other words, there are multiple ways of entry to the content of the work. Nazafarin: I like to think that my template is the reality of my studio. Instead of form invention, I make papier-mâché casts from the objects in my surroundings and then collage them to make hybrid forms. I also use found objects like dust masks or things from a souvenir shop in China Town that I see walking to my studio. These everyday objects introduce aspects of human presence to these spatial labyrinths. I want the sculptures to be read as living spaces rather than as formal abstract objects. Lise: These human presences are also points of entry into the works. When you mentioned the content of the works, what did you have in mind? Nazafarin: By content, I mean the space trapped inside. Lise: It’s interesting you use the word “trapped” in reference to negative space or interiority. 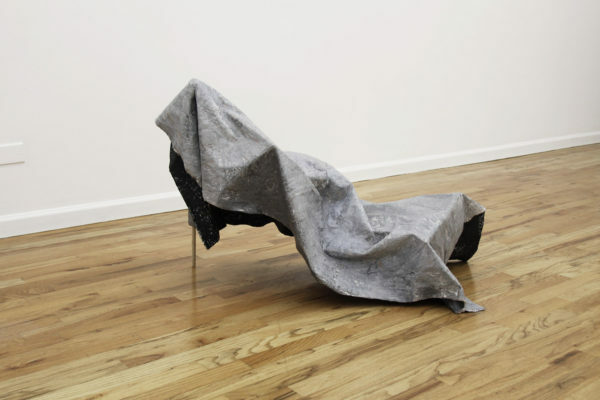 Nazafarin: When I make these sculptures, I am more interested in the space within them. I like to think about that in relationship to my view growing up. My bedroom windows were facing the mountains and I was always wondering what was beyond those mountains. It’s the desire for the unseen and the imagined. Lise: Is this interest in the inside new to your work? Nazafarin: Yes, this focus on the physical interior is relatively new in my work. Lise: What about associations between interiority and cultural constructions of gender? Nazafarin: I don’t consider my work and the kinds of space it provides to be particularly gendered but it is intimate and tactile. I’ve been focusing on interior space as the space beyond reach, going back to the landscape it is the space beyond the horizon. I look at the horizon as a beginning, an opening for exploration rather than a confinement. The horizon is subjective, shifts constantly, and is bounded by our point of view. Lise: Are your landscape paintings a way of distilling your experiences in the park? Nazafarin: This is an interesting way to think about it. The emptiness and interiority in my work allow the viewers to have different readings of it. I’m interested in the subjectivities of lived experience as simple as the shift in horizon from standing to sitting, and thinking about these in relationship to the binaries out of which our identities are constructed. Lise: Identity is subjectively created and lived within us at the same time that it’s imposed from the outside. As we and the world around us constantly change, the matrix of identity also transforms—rather like the movement of the horizon. Nazafarin: That notion of how people see you became evident in my adult life. When I was younger and living in Iran I was more concerned about being a woman and pushing against the gendered stereotypes that were imposed on me. Being here has brought up a lot of questions about identity both in terms of gender and race. I don’t address it explicitly in my work but stretching sculptures or objects to their limits is a way that I hope we can talk about identity. There’s so much fetishism in biographies of artists who are not white or straight and I find that dangerous. I didn’t become an artist to talk about my identity. I chose to become an artist when I was much younger. I chose it to address my surroundings. I chose it to access questions of imagination, as a way of connecting with and understanding the world. I think art is a beautiful medium for that.